Features 1/2 H.P., 50 amp, high torque motor -- runs cooler under loads and delivers over 80% more lifts per charge. Industrial grade gear box transmits steady power and is preferable to other drive designs. Heavyduty I-Beam construction of custom lightweight alloy frame. Large 2" dia. 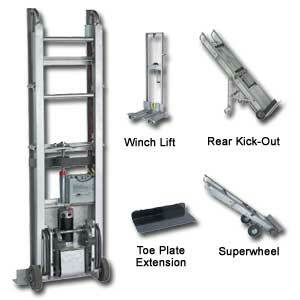 polyurethane lifting feet provide more secure stair gripping. Auto rewind ratchet works first to take the slack out of the cargo belt -- then provides a ratchet crank to tighten the load. Sealed maintenance-free battery. Charger in circuit breaker included. Rolls on 6" mold-on rubber wheels. Noseplate measures 24" x 4". Appliance truck measures 19"W. x 15"D. FOB Shipping Point. 800 lb. capacity. 31⁄2" swivel casters for 4 wheel support. Equipped with auto-braking system. 18" forks adjustable up to 19" outside dim. 58" lift height. Measures 25"W. x 30"D. x 70"H.
Easily clips on to standard nose plate and provides a 12"D. x 28"W. cargo surface. Slides into place over winch lift forks to provide a 20" x 20" lifting platform. Equipped with 10" x 4" full pneumatic tires. Provides 4 wheel support and eases transport over rough surfaces. Features 3.5" swivel casters for 4 wheel support. Retracts when not in use. Easy installed -- no drilling. Product No. Height Wt. (lbs.) Price Ea.